The AVFoundation framework provides a feature-rich set of classes to facilitate the editing of audio visual assets. At the heart of AVFoundation’s editing API are compositions. A composition is simply a collection of tracks from one or more different media assets. The AVMutableComposition class provides an interface for inserting and removing tracks, as well as managing their temporal orderings. Figure 3-1 shows how a new composition is pieced together from a combination of existing assets to form a new asset. If all you want to do is merge multiple assets together sequentially into a single file, that is as much detail as you need. If you want to perform any custom audio or video processing on the tracks in your composition, you need to incorporate an audio mix or a video composition, respectively. Using the AVMutableAudioMix class, you can perform custom audio processing on the audio tracks in your composition, as shown in Figure 3-2. Currently, you can specify a maximum volume or set a volume ramp for an audio track. 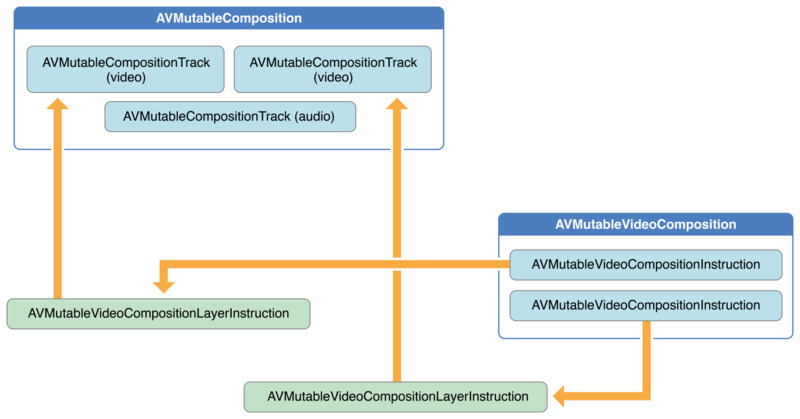 You can use the AVMutableVideoComposition class to work directly with the video tracks in your composition for the purposes of editing, shown in Figure 3-3. With a single video composition, you can specify the desired render size and scale, as well as the frame duration, for the output video. Through a video composition’s instructions (represented by the AVMutableVideoCompositionInstruction class), you can modify the background color of your video and apply layer instructions. These layer instructions (represented by the AVMutableVideoCompositionLayerInstruction class) can be used to apply transforms, transform ramps, opacity and opacity ramps to the video tracks within your composition. The video composition class also gives you the ability to introduce effects from the Core Animation framework into your video using the animationTool property. To combine your composition with an audio mix and a video composition, you use an AVAssetExportSession object, as shown in Figure 3-4. You initialize the export session with your composition and then simply assign your audio mix and video composition to the audioMix and videoComposition properties respectively. When adding new tracks to a composition, you must provide both a media type and a track ID. Although audio and video are the most commonly used media types, you can specify other media types as well, such as AVMediaTypeSubtitle or AVMediaTypeText. Every track associated with some audiovisual data has a unique identifier referred to as a track ID. If you specify kCMPersistentTrackID_Invalid as the preferred track ID, a unique identifier is automatically generated for you and associated with the track. Note: Placing multiple video segments on the same composition track can potentially lead to dropping frames at the transitions between video segments, especially on embedded devices. Choosing the number of composition tracks for your video segments depends entirely on the design of your app and its intended platform. 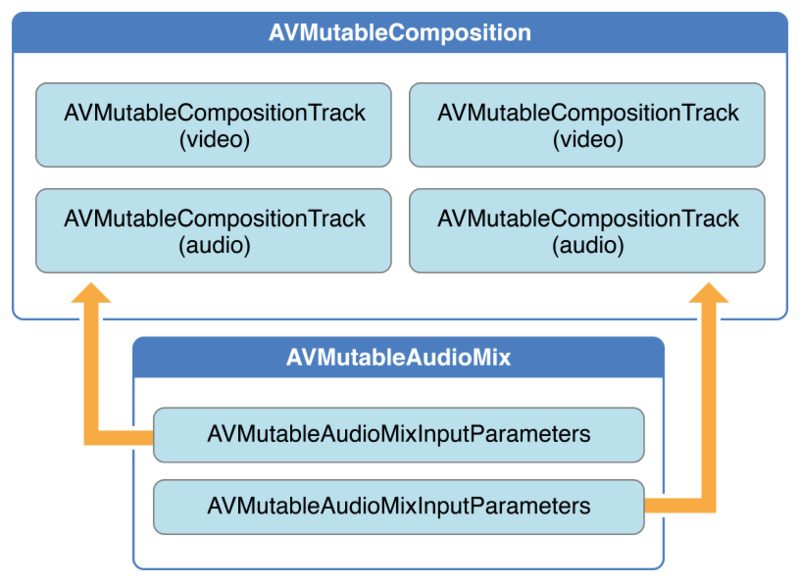 As with an audio mix, you only need one AVMutableVideoComposition object to perform all of your custom video processing on your composition’s video tracks. Using a video composition, you can directly set the appropriate render size, scale, and frame rate for your composition’s video tracks. For a detailed example of setting appropriate values for these properties, see Setting the Render Size and Frame Duration. All video compositions must also have an array of AVVideoCompositionInstruction objects containing at least one video composition instruction. You use the AVMutableVideoCompositionInstruction class to create your own video composition instructions. Using video composition instructions, you can modify the composition’s background color, specify whether post processing is needed or apply layer instructions. The following example illustrates how to create a video composition instruction that changes the background color to red for the entire composition. Note: To focus on the most relevant code, this example omits several aspects of a complete app, such as memory management and error handling. To use AVFoundation, you are expected to have enough experience with Cocoa to infer the missing pieces. To piece together tracks from separate assets, you use an AVMutableComposition object. Create the composition and add one audio and one video track. An empty composition does you no good. Add the two video asset tracks and the audio asset track to the composition. Note: This assumes that you have two assets that contain at least one video track each and a third asset that contains at least one audio track. The videos can be retrieved from the Camera Roll, and the audio track can be retrieved from the music library or the videos themselves. Once you add your video and audio tracks to the composition, you need to ensure that the orientations of both video tracks are correct. By default, all video tracks are assumed to be in landscape mode. If your video track was taken in portrait mode, the video will not be oriented properly when it is exported. Likewise, if you try to combine a video shot in portrait mode with a video shot in landscape mode, the export session will fail to complete. Once you know the video segments have compatible orientations, you can apply the necessary layer instructions to each one and add these layer instructions to the video composition. All AVAssetTrack objects have a preferredTransform property that contains the orientation information for that asset track. This transform is applied whenever the asset track is displayed onscreen. In the previous code, the layer instruction’s transform is set to the asset track’s transform so that the video in the new composition displays properly once you adjust its render size. To complete the video orientation fix, you must adjust the renderSize property accordingly. You should also pick a suitable value for the frameDuration property, such as 1/30th of a second (or 30 frames per second). By default, the renderScale property is set to 1.0, which is appropriate for this composition. The final step in this process involves exporting the entire composition into a single video file and saving that video to the camera roll. You use an AVAssetExportSession object to create the new video file and you pass to it your desired URL for the output file. You can then use the ALAssetsLibrary class to save the resulting video file to the Camera Roll.